A healthcare power of attorney allows you to appoint a health care representative to make medical treatment decisions for you. These include the right to refuse or consent to any treatment to diagnose, treat, or maintain a mental or physical condition. You can also indicate whether there are any treatments that you do not wish to receive. The representative will also have the right to examine your medical records. 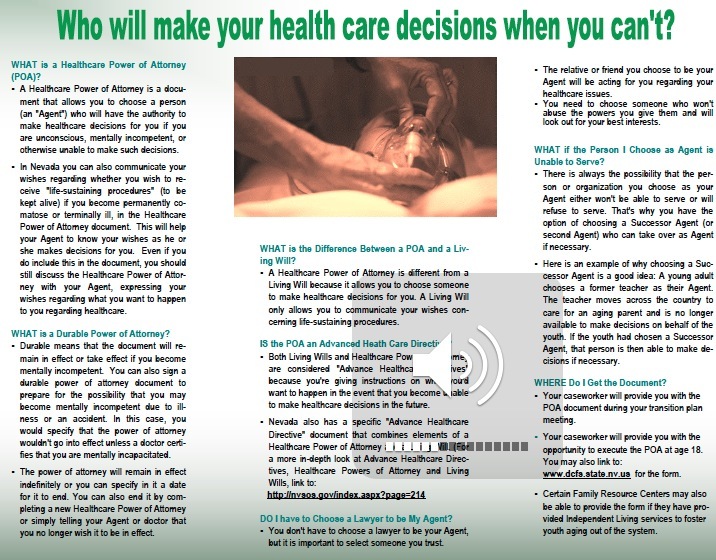 You can revoke the power of attorney at any time by notifying your healthcare provider in writing or verbally. This form also allows you to state your preferred medical treatments so doctors and everyone else will know what type of treatment you want if you are unable to communicate. The statutory Nevada healthcare power of attorney form allows you to indicate that you would like to prolong your life to the greatest extent possible, without regard to the condition or your chances for recovery or long-term survival. On the other hand, you can request that no life-sustaining treatments be used if you suffer from an irreversible comatose state or an incurable, terminal condition with no reasonable hope of recovery. You can also choose to receive only artificial hydration and nutrition after all other treatments have been withheld.